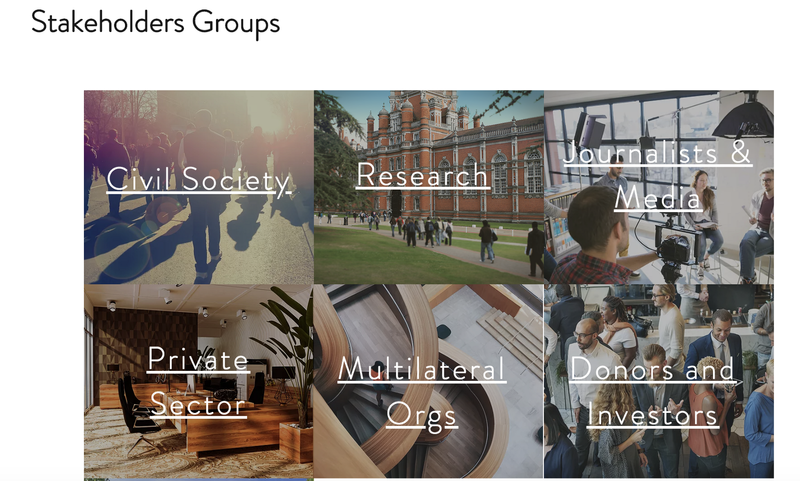 Over the last ten months our fantastic team of authors, reviewers and contributors have been working to create short summary articles that take stock of the open data landscape in particular communities, amongst particular stakeholder groups, in different regions, or in light of key cross-cutting issues. We started with an open brainstorm (environment scans), and have used these to create peer-reviewed chapters, containing examples, case studies, and recommendations for further reading. Ahead of the International Open Data Conference in Buenos Aires, we’re publishing quick-read ‘key points’ summaries, as well as public drafts of a number of chapters. You can also read our overall summary blog post here. Civil society has been a driving force in advancing open data agendas, including through standard setting, and taking open data ideas into new fields. The conceptual ambiguity of open government data presents strategic dilemmas for civil society, and can lead to competition between civil society and start-ups for resources. Smaller civil society organisations still lack the the resources needed to invest in the hard technical capacities they need to take advantage of open data. Future work should move beyond engagement with ‘usual suspects’ at international events, to focus on the open data capacity and needs of established national-level civil society organisations. Private sector actors play three key roles in open data: as data users, intermediaries and, increasingly, data providers through data collaboratives. Incubators and accelerators have supported hundreds of companies around the world to apply and use open data. Large and small businesses use open data both for business operations and to create new products and services. Open data remains, in many places, an untapped resource — with more work needed to support SMEs in particular to realise the benefits it can bring to drive business innovation. Open data programming and funding is becoming more mainstreamed into sectors, but progress is uneven. More donors have focused particularly on open data for anti-corruption, journalism and media, national statistics, extractives, international aid and disaster relief, government finance and agriculture. Open data has become a more global and diverse movement. Investments in open data now cover multiple continent and target a variety of stakeholders, but more should be done to make their collective impact more coherent . A global infrastructure to support the open data community has emerged, including a global agenda, coordinated investments mechanisms, measurement and global and regional convenings. Yet, it is unclear if open data will remain as a coherent community. There is a need and potential for substantial new and joined up investments among open data funders, and data funders in general, especially to meet cross cutting needs that are hard for anyone project or organization or donor to address alone. Data journalists have a key role to play as public interest watch-dogs. The label data journalism can cover a wide range of practices, from using data science to find stories, to storytelling with data and creating interactive content and visualisations alongside reports. The costs and complexity of effective data journalism, combined with the time-pressures common in reporting, make for a difficult business case. Finding sustainable models of data journalism is all the more urgent as traditional media outlets face competition from online competitors. The promise of ‘automated journalism’ from open data is largely unfulfilled. However, if more media houses focus on making open data as an essential source, we may see more examples of automation tools in the future. This is a critical moment for public trust, and there is no clear template for how data journalism can be part of the response. Over the last decade, many governments have moved from open data experimentation, towards consolidation: making open data part of the public sector’s usual way of doing business. There is growing awareness of the need to ‘upgrade’ policies, institutional structures, arrangements and practices to produce, manage, and use government data to secure long term sustainability and continuity of open data initiatives. As Open Data related initiatives become part of broader efforts to advance the digital transformation of public sectors across countries it becomes essential to establish linkages between open data and other policy areas. There has been a substantial growth in research on Open Data since 2007, with two broad clusters of research emerging: one driven primarily from within science, technology and higher education (scientific network), and the other rooted in the work of transnational NGOs and social movements (development network). The Open Data Research Symposium is the only regular academic conference focussed entirely on open data, although a number of conferences have hosted regular or occasional open data tracks. This has helped stimulate research, and is contributing to connect research and practice. Bibliometric analysis suggests that scientific articles on open government data are predominantly produced by male authors from the global North with a trend of co-authorship, although in development networks there is greater diversity of authors but shorter and reducing duration of studies. Researchers needs to go further to make sure it is relevant to communities who have been identified as potential beneficiaries of open data. Multilateral organisations, such as the development banks, play a key role in promoting development outcomes in low and middle income countries. They do this through providing finance, connecting a wide range of stakeholders (including the private sector), and providing technical assistance and knowledge transfer. Since 2010, a number of multilaterals have deployed their considerable capacity to support open data initiatives. There is increasing understanding about how context affects open data interventions: and a move from ‘copy paste’ of models between countries, to more context-sensitive and tailored intervention design. Multilaterals also invest in many other aspects of the data ecosystem, and could achieve substantial impact by mainstreaming open data work across their operations. This could maximise the return on their investments in projects that have a data component. Want more? We’ll be publishing the full State of Open Data collection, with additional and updated chapters in early 2019. Follow us @stateofopendata for updates. A review of the open data movement and its capacity to address social and economic challenges across sectors, regions, & communities.